All winter long, waterfront cottage owners dreamed of swimming, boating and fishing in the water just off of their dock. However, when the ice and snow melted, and the warmer spring air blew in, many realized they had a problem. There would be no swimming in the lake as slimy, foul-smelling weeds had overgrown their little patch of paradise. For those bewildered as to how to manage aquatic plants at their waterfront properties, both Joe DeMarco of Weeds B Gone and Andreas Keung of Aqua Weed Harvesting offer expert advice. WeedsBGone started 18 years ago when DeMarco’s friends were having weed problems of their own. He decided to try to help them to make better use of their beautiful lakeside home, and in doing so, recognized a much larger demand for professional weed removal services in the waters of Ontario lakes and beyond. Although his business started by simply cutting and harvesting the plants, his research later uncovered better ways of managing aquatic weeds. “The whole industry is going the way of aeration,” says DeMarco. “This method pumps oxygen into the bottom of a lake, for example, along with our natural vegetable-based enzymes which consume the muck which coats everything and provides a breeding ground for these unwanted plants. Keung’s company, Aqua Weed Harvesting, specializes in controlling the vegetation growth of lakes connected to the Trent-Severn Waterway. 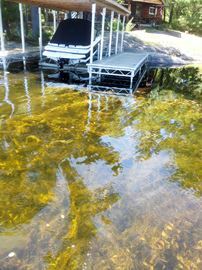 “For some cottagers, especially those with children who want to swim in the lake, weeds are a serious problem,” he says. “We are also seeing fewer and fewer fish spawning in our lakes. Cutting the weeds and aerating the lake is not only doing us a favour, it’s helping the fish population as well. “There is a completely different process to removing weeds along Trent,” adds Keung, noting homeowners need to apply for a permit before any work on the lake can commence. For cottagers who would like to start getting their lake weeds under control now, Mr. Keung suggests trying muck pellets. These can be purchased online from several manufacturers. The pellets are all-natural and they work to dissolve the muck, silt and grime at the bottom of the lake, lowering phosphorous levels and increasing oxygen content in the water. As for cutting the weeds, he suggests getting it done once a year. Although some critics say removing any natural plant growth from lakes or rivers is unnecessary and harmful to the fish and other wildlife which reside there, studies show that the opposite is true. While plants are natural and important components of the aquatic environment, excessive growths of algae and other vegetation can actually have a detrimental effect on the quality of a body of water as well as on the space’s inhabitants. Overgrown aquatic weeds can stunt fish population as the plants deplete the water of oxygen. Excessive weeds can also detract from the aesthetic appeal of a body of water, making any resale of a waterfront home difficult. Some algae varieties even produce a nasty taste and odours which make spending time near the water an unpleasant experience for all. He cautions, however, that cottage owners should be aware of any regulations that affect what they can, and cannot do, in their particular body of water. • You must be the waterfront property owner or conducting work on behalf of the property owner. • You must only conduct work on shore lands directly in front of your property or your client’s property. • You must minimize the removal of native aquatic vegetation (e.g. wild rice). • You must dispose of the plants/material you remove on dry land to prevent it from re-entering the water. • You must use, operate or store any wheeled or tracked machinery/equipment on dry land, or on a barge or vessel. • You must only use mechanical devices (e.g. rakes, cutter bars) or your hands to remove plants, and not dredge the bed of the water body. • Do not carry out the work during fish spawning season or during the time of other critical fish life stages as set out in the In-water Work Timing Window Guidelines. To learn more about government regulations concerning the removal of aquatic plants, visit www.ontario.ca/environment-and-energy/remove-invasive-aquatic-plants. Visit www.weedsbgone.com to learn how DeMarco and his team can help you reclaim your recreational water area.